A gyroscope (from Ancient Greek γῦρος gûros, "circle" and σκοπέω skopéō, "to look") is a spinning wheel or disc in which the axis of rotation is free to assume any orientation by itself. When rotating, the orientation of this axis is unaffected by tilting or rotation of the mounting, according to the conservation of angular momentum. Because of this, gyroscopes are useful for measuring or maintaining orientation. Gyroscopes based on other operating principles also exist, such as the electronic, microchip-packaged MEMS gyroscopes found in consumer electronics devices, solid-state ring lasers, fibre optic gyroscopes, and the extremely sensitive quantum gyroscope. Applications of gyroscopes include inertial navigation systems where magnetic compasses would not work (as in the Hubble telescope) or would not be precise enough (as in intercontinental ballistic missiles), or for the stabilization of flying vehicles like radio-controlled helicopters or unmanned aerial vehicles, and recreational boats and commercial ships. Due to their precision, gyroscopes are also used in gyrotheodolites to maintain direction in tunnel mining. Gyroscopes can be used to construct gyrocompasses, which complement or replace magnetic compasses (in ships, aircraft and spacecraft, vehicles in general), to assist in stability (Hubble Space Telescope, bicycles, motorcycles, and ships) or be used as part of an inertial guidance system. Within mechanical systems or devices, a conventional gyroscope is a mechanism comprising a rotor journaled to spin about one axis, the journals of the rotor being mounted in an inner gimbal or ring; the inner gimbal is journaled for oscillation in an outer gimbal for a total of two gimbals. The outer gimbal or ring, which is the gyroscope frame, is mounted so as to pivot about an axis in its own plane determined by the support. This outer gimbal possesses one degree of rotational freedom and its axis possesses none. The next inner gimbal is mounted in the gyroscope frame (outer gimbal) so as to pivot about an axis in its own plane that is always perpendicular to the pivotal axis of the gyroscope frame (outer gimbal). This inner gimbal has two degrees of rotational freedom. The axle of the spinning wheel defines the spin axis. The rotor is journaled to spin about an axis, which is always perpendicular to the axis of the inner gimbal. So the rotor possesses three degrees of rotational freedom and its axis possesses two. The wheel responds to a force applied about the input axis by a reaction force about the output axis. The centre of gravity of the rotor can be in a fixed position. The rotor simultaneously spins about one axis and is capable of oscillating about the two other axes, and, thus, except for its inherent resistance due to rotor spin, it is free to turn in any direction about the fixed point. Some gyroscopes have mechanical equivalents substituted for one or more of the elements. For example, the spinning rotor may be suspended in a fluid, instead of being pivotally mounted in gimbals. A control moment gyroscope (CMG) is an example of a fixed-output-gimbal device that is used on spacecraft to hold or maintain a desired attitude angle or pointing direction using the gyroscopic resistance force. In some special cases, the outer gimbal (or its equivalent) may be omitted so that the rotor has only two degrees of freedom. In other cases, the centre of gravity of the rotor may be offset from the axis of oscillation, and, thus, the centre of gravity of the rotor and the centre of suspension of the rotor may not coincide. 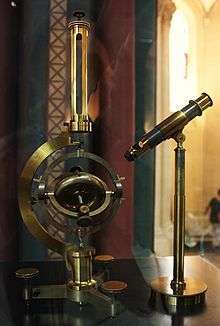 The first instrument used more like an actual gyroscope was made by German Johann Bohnenberger, who first wrote about it in 1817. At first he called it the "Machine". Bohnenberger's machine was based on a rotating massive sphere. In 1832, American Walter R. Johnson developed a similar device that was based on a rotating disc. The French mathematician Pierre-Simon Laplace, working at the École Polytechnique in Paris, recommended the machine for use as a teaching aid, and thus it came to the attention of Léon Foucault. In 1852, Foucault used it in an experiment involving the rotation of the Earth. It was Foucault who gave the device its modern name, in an experiment to see (Greek skopeein, to see) the Earth's rotation (Greek gyros, circle or rotation), which was visible in the 8 to 10 minutes before friction slowed the spinning rotor. In the 1860s, the advent of electric motors made it possible for a gyroscope to spin indefinitely; this led to the first prototype heading indicators, and a rather more complicated device, the gyrocompass. The first functional gyrocompass was patented in 1904 by German inventor Hermann Anschütz-Kaempfe. The American Elmer Sperry followed with his own design later that year, and other nations soon realized the military importance of the invention—in an age in which naval prowess was the most significant measure of military power—and created their own gyroscope industries. The Sperry Gyroscope Company quickly expanded to provide aircraft and naval stabilizers as well, and other gyroscope developers followed suit. A gyrostat is a variant of the gyroscope. It consists of a massive flywheel concealed in a solid casing. Its behaviour on a table, or with various modes of suspension or support, serves to illustrate the curious reversal of the ordinary laws of static equilibrium due to the gyrostatic behaviour of the interior invisible flywheel when rotated rapidly. The first gyrostat was designed by Lord Kelvin to illustrate the more complicated state of motion of a spinning body when free to wander about on a horizontal plane, like a top spun on the pavement, or a hoop or bicycle on the road. Kelvin also made use of gyrostats to develop mechanical theories of the elasticity of matter and of the ether; these theories are of purely historical interest today. A MEMS gyroscope takes the idea of the Foucault pendulum and uses a vibrating element, known as a MEMS (microelectromechanical system). The MEMS-based gyro was initially made practical and producible by Systron Donner Inertial (SDI). Today, SDI is a large manufacturer of MEMS gyroscopes. The hemispherical resonator gyroscope (HRG), also called wine-glass gyroscope or mushroom gyro, makes using a thin solid-state hemispherical shell, anchored by a thick stem. This shell is driven to a flexural resonance by electrostatic forces generated by electrodes which are deposited directly onto separate fused-quartz structures that surround the shell. Gyroscopic effect is obtained from the inertial property of the flexural standing waves. A vibrating structure gyroscope (VSG), also called a Coriolis vibratory gyroscope (CVG), uses a resonator made of different metallic alloys. It takes a position between the low-accuracy, low-cost MEMS gyroscope and the higher-accuracy and higher-cost FOG. Accuracy parameters are increased by using low-intrinsic damping materials, resonator vacuumization, and digital electronics to reduce temperature dependent drift and instability of control signals. High quality wine-glass resonators are used for precise sensors like HRG or CRG. A ring laser gyroscope relies on the Sagnac effect to measure rotation by measuring the shifting interference pattern of a split beam of light as it moves around the ring in opposite directions. In addition to being used in compasses, aircraft, computer pointing devices, etc., gyroscopes have been introduced into consumer electronics. Since the gyroscope allows the calculation of orientation and rotation, designers have incorporated them into modern technology. The integration of the gyroscope has allowed for more accurate recognition of movement within a 3D space than the previous lone accelerometer within a number of smartphones. Gyroscopes in consumer electronics are frequently combined with accelerometers (acceleration sensors) for more robust direction- and motion-sensing. Examples of such applications include smartphones such as the Samsung Galaxy Note 4, HTC Titan, Nexus 5, iPhone 5s, Nokia 808 PureView and Sony Xperia, game console peripherals such as the PlayStation 3 controller and the Wii Remote, and virtual reality sets such as the Oculus Rift. An electric powered flywheel gyroscope inserted in a bicycle wheel is being sold as a training wheel alternative. Anti-rolling gyro — Ship gyroscopic roll stabilizers. ↑ "Gyroscope". Oxford Dictionaries. Retrieved 4 May 2015. ↑ "20 things you didn't know about tunnels". Discover (magazine). April 29, 2009. ↑ Range, Shannon K'doah; Mullins, Jennifer. "Brief History of Gyroscopes". Archived from the original on 2015-07-10. ↑ Johann G. F. Bohnenberger (1817) "Beschreibung einer Maschine zur Erläuterung der Gesetze der Umdrehung der Erde um ihre Axe, und der Veränderung der Lage der letzteren" (Description of a machine for the explanation of the laws of rotation of the Earth around its axis, and of the change of the orientation of the latter), Tübinger Blätter für Naturwissenschaften und Arzneikunde, vol. 3, pages 72–83. ↑ A photograph of Bohnenberger's instrument is available on-line here: Ion.org ION Museum: The Machine of Bohnenberger . ↑ Walter R. Johnson (January 1832). "Description of an apparatus called the rotascope for exhibiting several phenomena and illustrating certain laws of rotary motion", The American Journal of Science and Art, 1st series, vol. 21, no. 2, pages 265–280. ↑ Drawings of Walter R. Johnson's gyroscope ("rotascope") were used to illustrate phenomena in the following lecture: E.S. Snell (1856) "On planetary disturbances," Board of Regents, Tenth Annual Report of the Board of Regents of the Smithsonian Institution.... (Washington, D.C.: Cornelius Wendell, 1856), pages 175–190. ↑ Circa 1852, Friedrich Fessel, a German mechanic and former secondary school teacher, independently developed a gyroscope. See: (1) Julius Plücker (September 1853) "Über die Fessel'sche rotationsmachine", Annalen der Physik, vol. 166, no. 9, pages 174–177; (2) Julius Plücker (October 1853) "Noch ein wort über die Fessel'sche rotationsmachine", Annalen der Physik, vol. 166, no. 10, pages 348–351; (3) Charles Wheatstone (1864) "On Fessel's gyroscope", Proceedings of the Royal Society of London, vol. 7, pages 43–48. ↑ L. Foucault (1852) Comptes rendus..., vol. 35, page 427. ↑ Hermann Anschütz-Kaempfe and Friedrich von Shirach, "Kreiselapparat" (Gyroscope) Deutsches Reichspatent no. 182855 (filed: 27 March 1904 ; issued: 2 April 1907). ↑ Anon. "TEDCO Toys - Cool company history, great science kits". TEDCO Toys company website. O'Reilly Media Inc. Retrieved 23 December 2010. ↑ "Midget Gyros to Guided Missiles" March 1954, p. 148, bottom page. ↑ Kelon, Leo (9 September 2014). "Smartwatches: Specs and reviews for the leading models". Technology. BBC News. ↑ William Thomson (1875). Proc. London Math. Soc., vol. 6, pages 190–194. ↑ D. M. Harland (1997) The MIR Space Station (Wiley); D. M. Harland (2005) The Story of Space Station MIR (Springer). ↑ H. Sternberg; C. Schwalm (2007). "Qualification Process for MEMS Gyroscopes for the Use in Navigation Systems" (PDF). International Society for Photogrammetry and Remote Sensing Proceedings. Archived from the original (PDF) on 2 October 2011. ↑ Ash, M E; Trainor, C V; Elliott, R D; Borenstein, J T; Kourepenis, A S; Ward, P A; Weinberg, M S (14–15 September 1999). 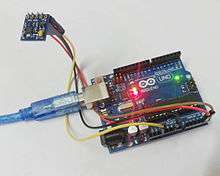 "Micromechanical inertial sensor development at Draper Laboratory with recent test results". Symposium Gyro Technology Proceedings. ↑ Sarapuloff S.A. High-Q Sapphire Resonator of Solid-State Gyroscope CRG-1 glass or from single-crystalline sapphire. ↑ David May (1999). "Modeling the dynamically tuned gyroscope in support of high-bandwidth capture loop design". Proc. SPIE. 3692: 101–111. doi:10.1117/12.352852. ↑ Einstein.stanford.edu. "The GP-B instrument is designed to measure changes in gyroscope spin axis orientation to better than 0.5 milliarcseconds (1.4x10-7 degrees) over a one-year period"
↑ Kobayashi, Takeshi; Hayakawa, Hisao; Tonouchi, Masayoshi. Vortex Electronics and SQUIDs. Google Books. pp. 44–45.